Despite appearances, the sky is not falling. Two weeks ago, however, tiny bits of comet dust were. 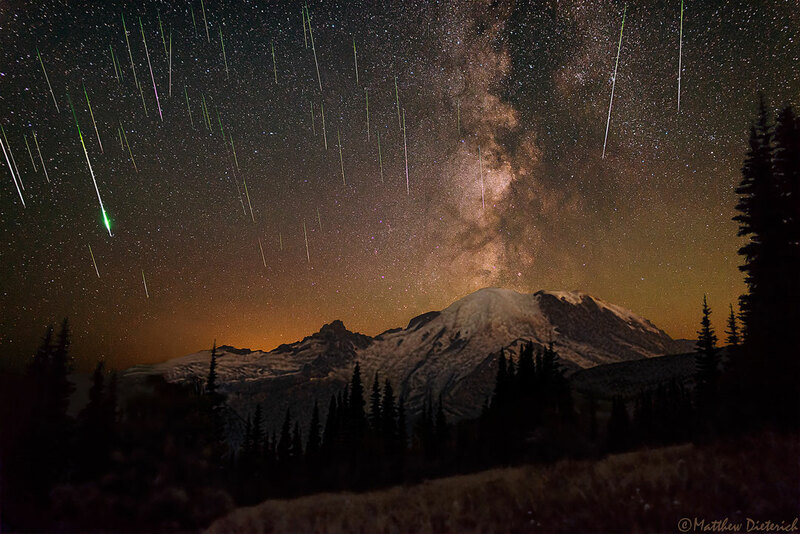 Featured here is the Perseids meteor shower as captured over Mt. Rainier, Washington, USA. The image was created from a two-hour time lapse video, snaring over 20 meteors, including one that brightened dramatically on the image left. Although each meteor train typically lasts less than a second, the camera was able to capture their color progressions as they disintegrated in the Earth's atmosphere. Here an initial green tint may be indicative of small amounts of glowing magnesium atoms that were knocked off the meteor by atoms in the Earth's atmosphere. To cap things off, the central band of our Milky Way Galaxy was simultaneously photographed rising straight up behind the snow-covered peak of Mt. Rainier. Another good meteor shower is expected in mid-November when debris from a different comet intersects Earth as the Leonids. Why does this galaxy have such a long tail? In this stunning vista, based on image data from the Hubble Legacy Archive, distant galaxies form a dramatic backdrop for disrupted spiral galaxy Arp 188, the Tadpole Galaxy. The cosmic tadpole is a mere 420 million light-years distant toward the northern constellation Draco. Its eye-catching tail is about 280 thousand light-years long and features massive, bright blue star clusters. One story goes that a more compact intruder galaxy crossed in front of Arp 188 - from right to left in this view - and was slung around behind the Tadpole by their gravitational attraction. During the close encounter, tidal forces drew out the spiral galaxy's stars, gas, and dust forming the spectacular tail. The intruder galaxy itself, estimated to lie about 300 thousand light-years behind the Tadpole, can be seen through foreground spiral arms at the upper right. Following its terrestrial namesake, the Tadpole Galaxy will likely lose its tail as it grows older, the tail's star clusters forming smaller satellites of the large spiral galaxy. What will become of these galaxies? Spiral galaxies NGC 5426 and NGC 5427 are passing dangerously close to each other, but each is likely to survive this collision. 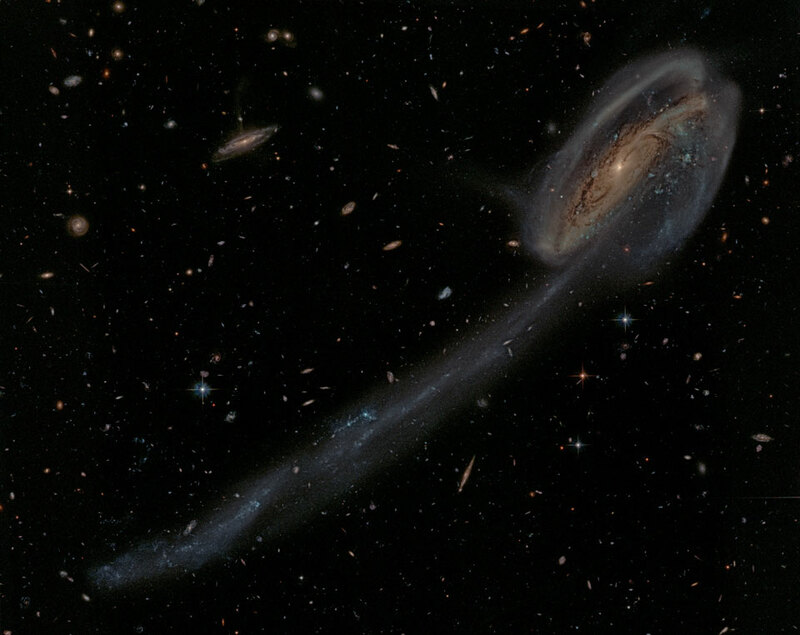 Typically when galaxies collide, a large galaxy eats a much smaller galaxy. In this case, however, the two galaxies are quite similar, each being a sprawling spiral with expansive arms and a compact core. As the galaxies advance over the next tens of millions of years, their component stars are unlikely to collide, although new stars will form in the bunching of gas caused by gravitational tides. Close inspection of the above image taken by the 8-meter Gemini-South Telescope in Chile shows a bridge of material momentarily connecting the two giants. 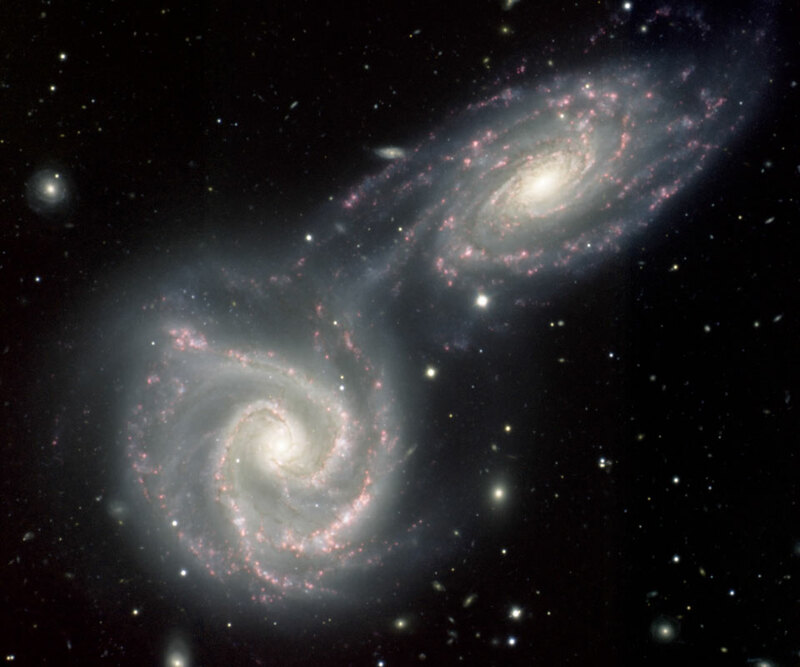 Known collectively as Arp 271, the interacting pair spans about 130,000 light years and lies about 90 million light-years away toward the constellation of Virgo. Recent predictions hold that our Milky Way Galaxy will undergo a similar collision with the neighboring Andromeda Galaxy in a few billion years. Medieval Albrechtsberg castle is nestled in trees near the northern bank of the river Pielach and the town of Melk, Austria. In clearing night skies on August 12 it stood under constellations of the northern summer, including Aquarius, Aquila, and faint, compact Delphinus (above and right of center) in this west-looking skyview. 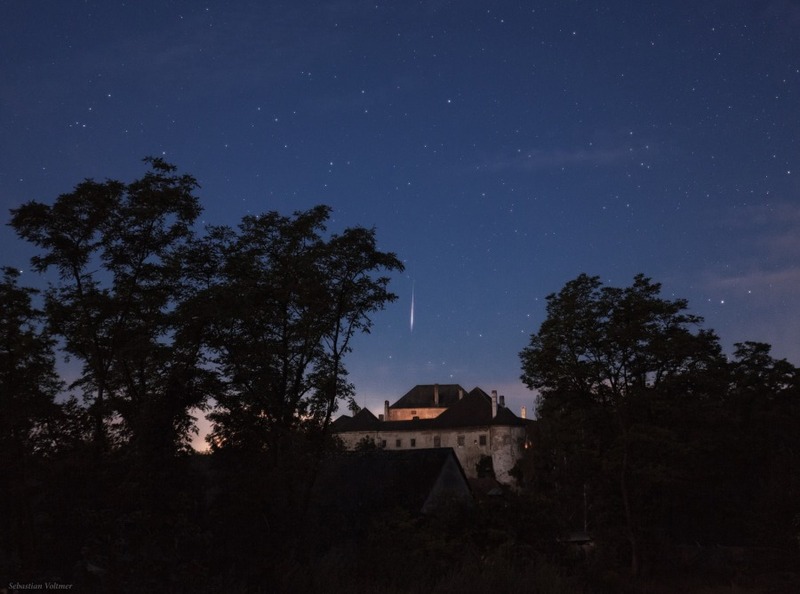 The scene also captures a bright meteor above the castle walls. Part of the annual perseid meteor shower, its trail points back toward the heroic constellation Perseus high above the horizon in the early morning hours. Entering the atmosphere at about 60 kilometers per second, perseid meteors are swept up dust grains from the tail of comet Swift-Tuttle. 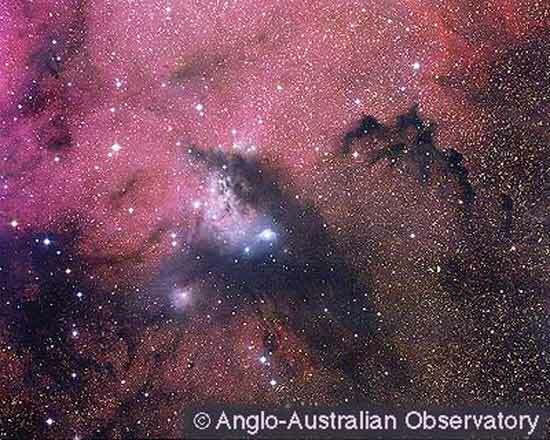 Look through the cosmic cloud cataloged as NGC 281 and it's almost easy to miss stars of open cluster IC 1590. But, formed within the nebula, that cluster's young, massive stars ultimately power the pervasive nebular glow. The eye-catching shapes looming in this portrait of NGC 281 are sculpted columns and dense dust globules seen in silhouette, eroded by intense, energetic winds and radiation from the hot cluster stars. If they survive long enough, the dusty structures could also be sites of future star formation. 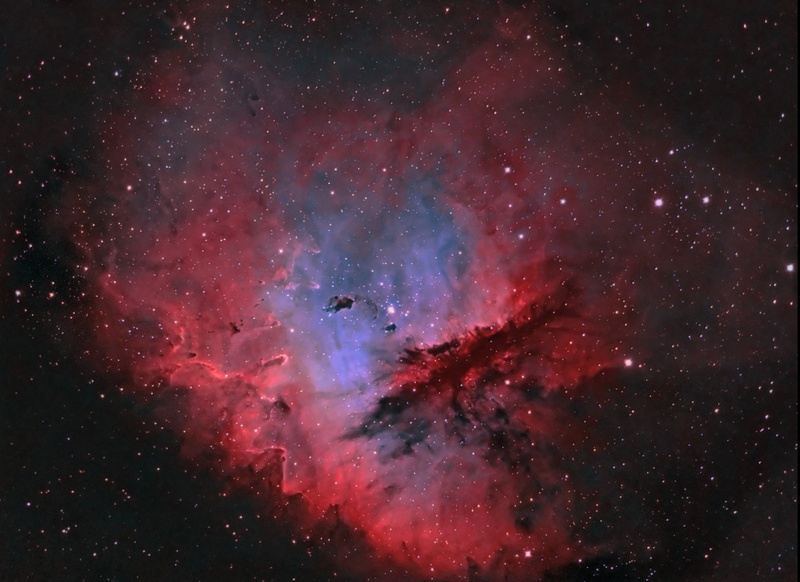 Playfully called the Pacman Nebula because of its overall shape, NGC 281 is about 10,000 light-years away in the constellation Cassiopeia. 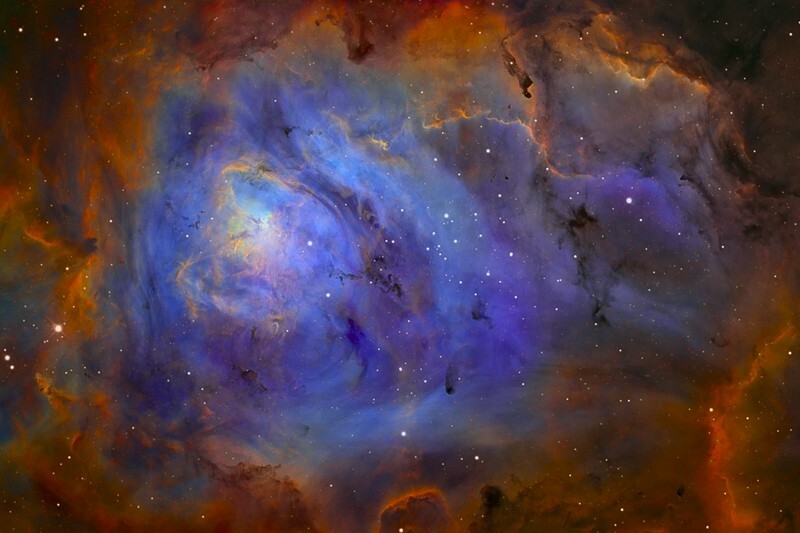 This composite image was made through narrow-band filters, but combines emission from the nebula's hydrogen, sulfur, and oxygen atoms in a visible spectrum palette. It spans over 80 light-years at the estimated distance of NGC 281. Do other rich planetary systems exist? Our Solar System has the most planets of any known star, most probably because it is so hard to detect planets around other stars. Sensitive measurements, though, have now uncovered a slight but complex wobble of the Sun-like star HD 10180 indicating that it has at least five planets and possibly more, making it the richest extra-solar planetary system yet known. HD 10180's planets were discovered in years of data using the sensitive HARPS spectrograph attached to the ESO's 3.6-meter telescope in La Silla, Chile. The planetary system appears quite different than our Solar System, since all of HD 10180's discovered planets have Neptune-like masses but orbit inside the distance of Mars. An artist's depiction of flying into this system is shown in the above video. In the future, more sensitive data taken over longer time periods may extend the star-wobble detection technique into the realm of uncovering more distant and more Earth-like planets. What would Saturn's rings look like if the ring plane pointed directly at the Sun? That situation occurred earlier this month when equinox occurred on Saturn. Since the Earth is nearly in the same direction as the Sun from Saturn, the rings appeared to disappear from Earth. From the robotic Cassini spacecraft orbiting Saturn, however, the unusually illuminated ring plane could be viewed from on high. Pictured above, Saturn's rings, darker than ever seen before, were captured just a few hours before equinox on 2009 August 10. The reason for the unusual brightness of an inner ring is currently unknown, but possibly related to particle sizes there being larger than the 10 meter average thickness of the rest of Saturn's rings. 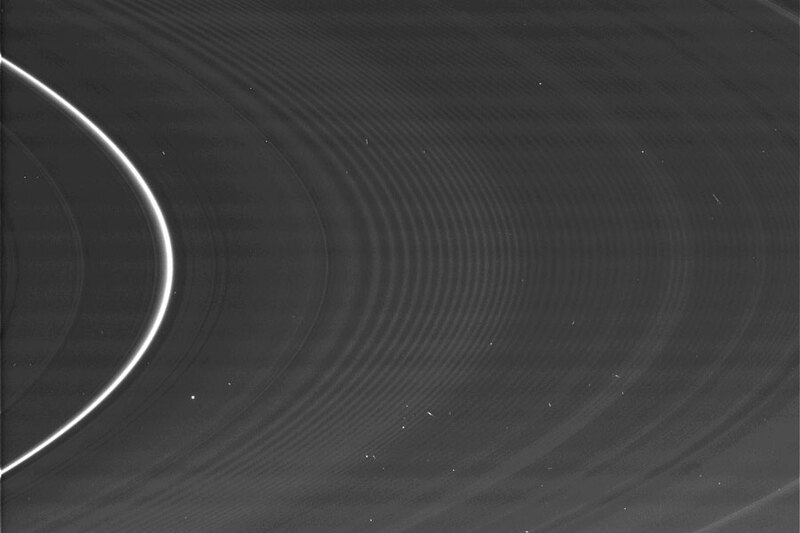 Short light streaks in the frame are artificial image artifacts and have nothing to do with Saturn's ring plane. Planetary scientists will be studying ring images taken near equinox to help better understand the dynamics and particle size distribution of the Solar System's most extensive ring system. Compact and round, NGC 7008 is recognized as a planetary nebula about 2,800 light-years distant in the nebula rich constellation of Cygnus. This impressive telescopic view shows off NGC 7008's remarkable colors and details by the skillful combination of broad band and narrow band images from two different telescopes with about 12 hours of total exposure time. 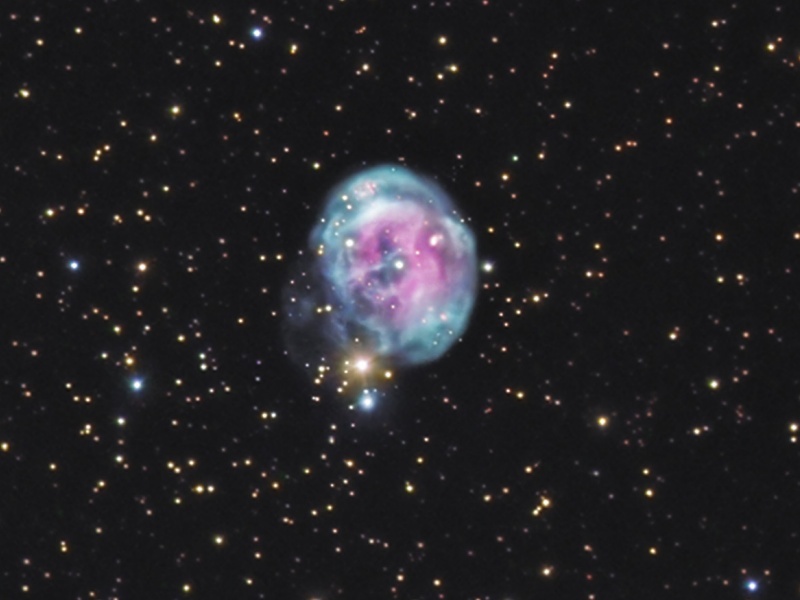 The intriguing assortment of features within the nebula's approximately 1 light-year diameter suggest its popular name, the Fetus Nebula, but planetary nebulae are not associated with star birth. Instead, nebulae like NGC 7008 are produced during a brief phase that sun-like stars pass through toward the end of their lives. Ejecting their outer layers, the stars cool to eventually become white dwarf stars, like the star seen near the center of NGC 7008. This colorful image also includes an unrelated but still lovely gold and blue binary star system just below NGC 7008. M33 is a big, beautiful spiral galaxy a mere 3 million light-years away, understandably a popular target for enthusiastic astro-imagers. Just as understandably, interfering satellite trails and airplane streaks that are becoming more common in planet Earth's busy night sky are processed out of their finished images. 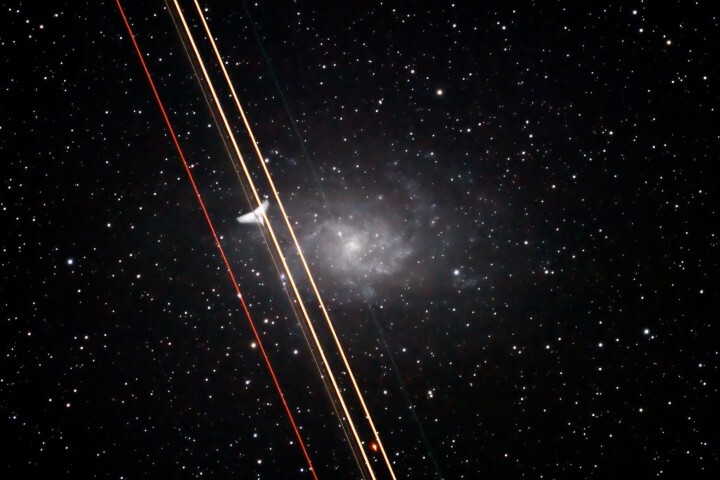 But Robert Stephan left these streaks in his final picture of M33, realizing that he had also recorded something relatively rare. His otherwise cosmic skyscape shows the tail of an aircraft passing overhead through his telescope's field of view. A navigational strobe light on the plane flashed across the tail at exactly the right moment. The brief illumination produced the incongruous, though remarkably sharp image. Stars come and go as you slide your cursor over this engaging image of M8, aka the Lagoon Nebula. Of course, the nebula is itself a star-forming region, but the stars that appear and disappear here include background and foreground stars that by chance lie along the same line of sight. In this "for fun" comparison of two nearly identical digital images, the stellar point sources were removed from one image by computer processing to leave only the diffuse emission from the glowing gas clouds. In both pictures, red emission (H-alpha emission) from atomic hydrogen dominates the cosmic lagoon's visible light, but narrow band filters were used to record the image data and map the hydrogen emission to green hues, with emission from sulfur atoms in red and oxygen in blue. The lovely Lagoon Nebula spans about 30 light-years at an estimated distance of 5,000 light-years toward the constellation Sagittarius. A recent survey of stars conducted with the Spitzer Space Telescope is convincing astronomers that our Milky Way Galaxy is not just your ordinary spiral galaxy anymore. 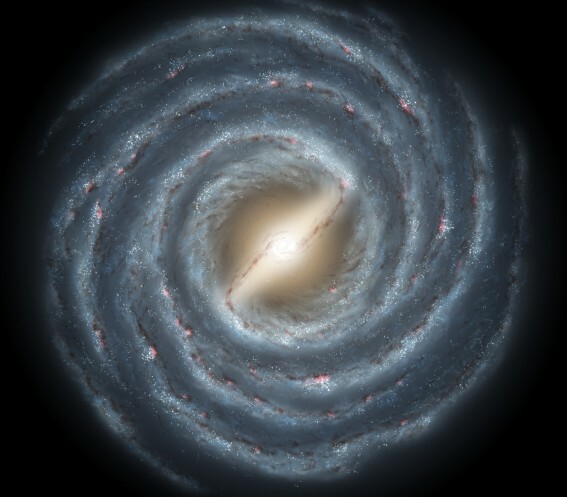 Looking out from within the Galaxy's disk, the true structure of the Milky Way is difficult to discern. However, the penetrating infrared census of about 30 million stars indicates that the Galaxy is distinguished by a very large central bar some 27,000 light-years long. In fact, from a vantage point that viewed our galaxy face-on, astronomers in distant galaxies would likely see a striking barred spiral galaxy suggested in this artist's illustration. While previous investigations have identified a small central barred structure, the new results indicate that the Milky Way's large bar would make about a 45 degree angle with a line joining the Sun and the Galaxy's center. DON'T PANIC ... astronomers still place the Sun beyond the central bar region, about a third of the way in from the Milky Way's outer edge. An unusual triangle of light will be particularly bright near the eastern horizon before sunrise during the next two months for observers in Earth's northern hemisphere. Once considered a false dawn, this triangle of light is actually Zodiacal Light, light reflected from interplanetary dust particles. The triangle is clearly visible in the left frame taken in Namibia in May. Rolling the cursor over the image will bring up labels. Bright zodiacal light can be seen nearly every clear moonless morning over the next few months on images taken by the Mauna Kea, Hawaii fisheye CONCAM of the Night Sky Live project. Zodiacal dust orbits the Sun predominantly in the same plane as the planets: the ecliptic. Zodiacal light is so bright this time of year because the dust band is oriented nearly vertical at sunrise, so that the thick air near the horizon does not block out relatively bright reflecting dust. 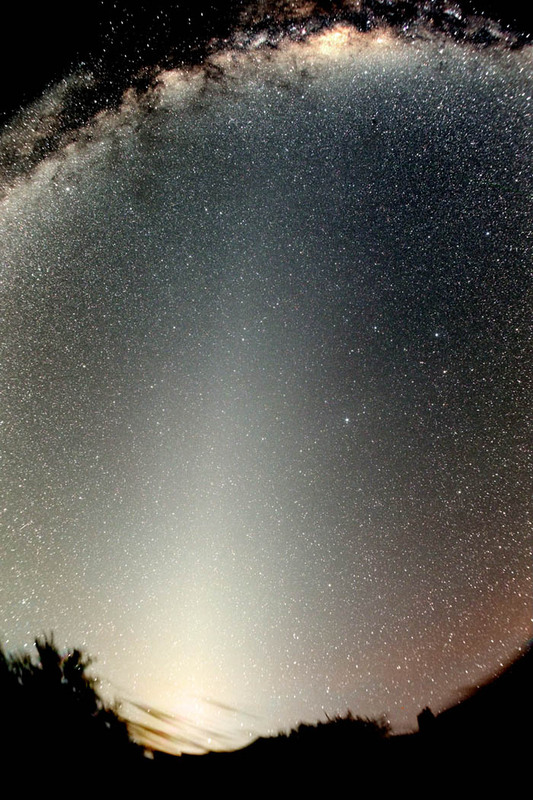 Zodiacal light is also bright for people in Earth's northern hemisphere in March and April just after sunset. Many of the stars in our home Milky Way Galaxy appear together as a dim band on the sky that passes nearly over the Earth's north and south poles. Pictured above is the part of our Galaxy that passes closest over the north pole. 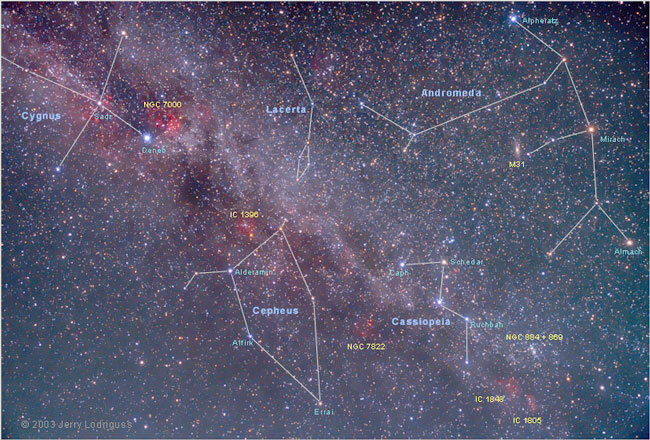 Placing your cursor over the image will bring up the names of several constellations and bright stars. The diffuse white Galaxy glow is created by billions of stars, while red patches are large emission nebulas, usually marking areas where bright stars have recently formed. In the north, all of the lights visible at night and all lights that created this image were emitted within the past few thousand years from within the Milky Way Galaxy -- except one. On the upper right is a small faint patch designated M31, the Andromeda Galaxy. M31 is a spiral galaxy similar to our Milky Way but so distant it emits the oldest light distinguishable by the unaided eye -- light that takes over two million years to reach us. Old photographs show no evidence of the above nebula. In 1992, a white dwarf star toward the constellation of Cygnus blew off its outer layers in a classical nova explosion: an event called Nova Cygni 1992. 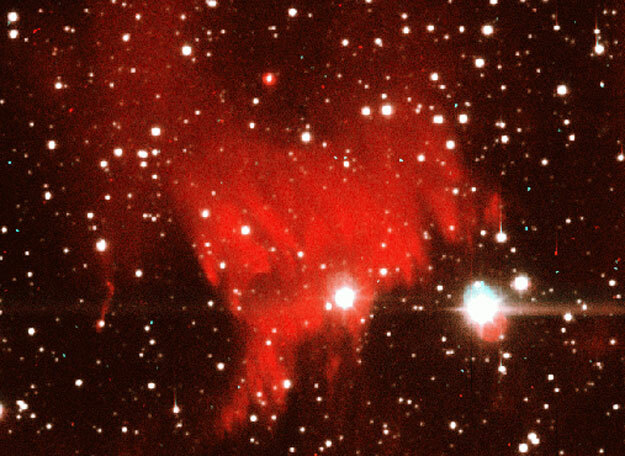 Light flooded the local interstellar neighborhood, illuminated this existing gas cloud, excited the existing hydrogen, and hence caused the red emission. The only gas actually expelled by the nova can be seen as a small red ball just above the photograph's center. Eventually, light from the nova shell will fade, and this nebula will again become invisible! Astypalaea Linea on Jovian ice moon Europa is the broad smooth region running through these images recorded by the Galileo spacecraft in 1998. The pictures are different computer processed versions of the same mosaic -- on the left, small scale details have been enhanced while on the right, large scale features are emphasized. In both versions, the bold criss-crossing ridges believed to result from the upwelling of new material through cracks in the surface ice are apparent. But more easily seen on the right are recently recognized gentle rises and dips, about 15 kilometers across, which likely formed as the icy surface was compressed by the addition of the new material. 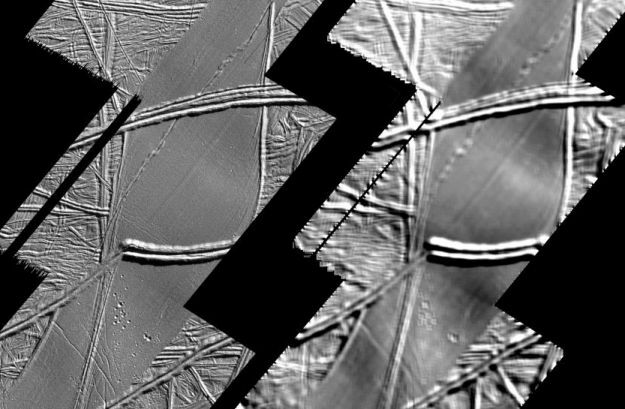 Further evidence that stress is folding Europa's surface is offered by the presence of smaller cracks and wrinkles more easily seen on the left. These span the width of the broad swells suggestive of anticlines and synclines familiar to geologists on planet Earth. Though ice covered, the surface of Europa is thought to be geologically active, riding over a substantial ocean of liquid water. NGC 6188 is an interstellar carnival of young blue stars, hot red gas, and cool dark dust. Located 4000 light years away in the disk of our Galaxy, NGC 6188 is home to the Ara OB1 association, a group of bright young stars whose nucleus forms the open cluster NGC 6193. These stars are so bright that some of their blue light reflects off of interstellar dust forming the diffuse blue glow in the center of the above photograph. Open cluster NGC 6193 formed about three million years ago from the surrounding gas, and appears unusually rich in close binary stars. The red glow visible throughout the photograph arises from hydrogen gas heated by the bright stars in Ara OB1. The dark dust that blocks much of NGC 6188's light was likely formed in the outer atmospheres of cooler stars and in supernovae ejecta. Before a relaxing sunrise, the sky begins to glow with unusual delights. Such was the view from Papago Park in Phoenix, Arizona this April. 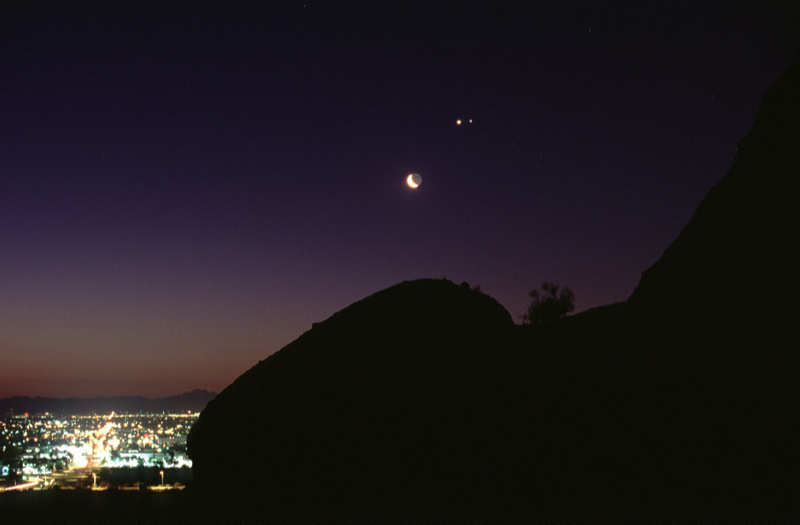 The glittering objects visible in this photograph are, from lower left to upper right: Phoenix, our Moon, Venus, and Jupiter. Such proximity is somewhat unusual. Jupiter will be visible in the evening sky through the rest of the year, while Venus can be seen in the early morning sky during the month of September. Thousands of stars, several constellations, a planet and a comet all graced the western horizon over Ujue, Spain just after sunset on April 4th, 1997. Because the picture was taken with a fisheye lens, much of the whole night sky is visible. 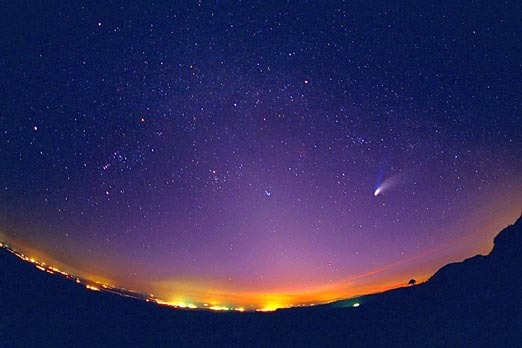 Comet Hale-Bopp, with both tails blazing, appears right of center. The brightest star is Sirius near the edge, well to the left of the constellation Orion. The red star above the belt of Orion is Betelgeuse, while the red star near the center is Aldebaran, just to the left of the bright Pleaides star cluster. Many other interesting astronomical objects are visible, including zodiacal light, which is the diffuse triangular glow in the center. Even the planet Mercury appears just over the horizon. 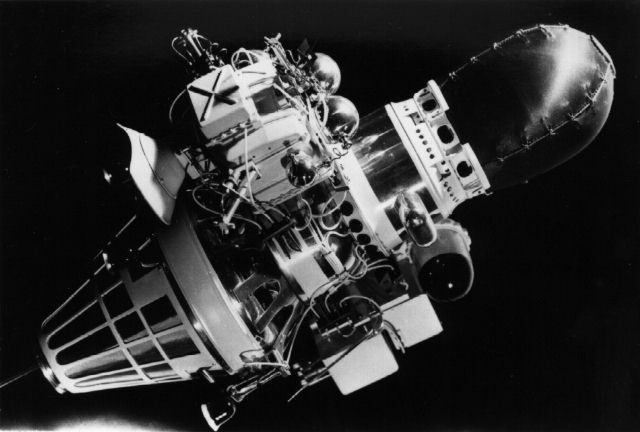 The Luna 9 spacecraft above performed the first soft landing on another planetary body. Following a series of failures, the Soviet probe touched down in the Moon's Oceanus Procellarum region February 3, 1966. It accomplished this milestone in lunar exploration only shortly after the death of Sergei Korolev, the father of the Soviet Space Program. Reportedly, Korolev's colleagues wished to dedicate the Luna 9 mission to him but were unable to as his role as the Chief Designer was still a state secret. A pole, just visible extending at the lower left, sensed the impact with the lunar surface, triggering the spacecraft to eject the weighted, egg-shaped capsule (upper right). The 250 pound capsule then struck the surface, rolled upright, unfolded four spring actuated petals to steady itself, and transmitted the first views from the lunar surface back to Earth. Ferdinand Magellan was a world explorer. Many consider him the greatest navigator of Europe's 16th century age of sea going exploration and credit his expedition with the first circumnavigation of planet Earth. NASA's Venus probe, the aptly named Magellan spacecraft shown above in an artist's conception, provided a global view of the poorly known surface of Venus - just as Magellan's expedition provided the beginnings of a global perspective of the Earth. Ferdinand Magellan's expedition of 5 ships and 265 men left Spain in 1519 in search of a western route to the Spice Islands of Indonesia. In 1522 one ship and 17 men returned. NASA launched the Magellan probe on May 4, 1989. Placed in a polar orbit, Magellan's many circumnavigations resulted in a detailed radar mapping of 98% of the Venusian surface. As pictured, the radar mapper's antenna resembles a large inverted bowl. Power for the radar was produced by the wing like solar panels. 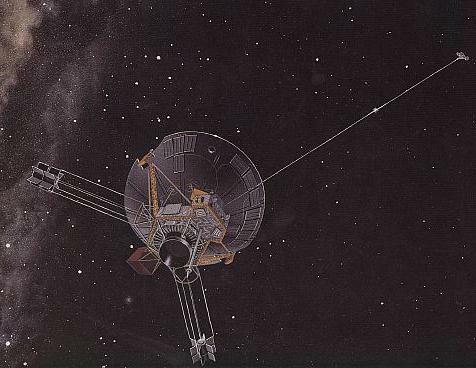 In October of 1994, the Magellan probe entered the Venusian atmosphere and ground controllers lost contact with the spacecraft. Another virtue of this effort of bystander, is that in a year we will be able to have seen all the APOD published by always. I come to learn and to have fun. Actually, owlice started it, but she keeps letting her job interfere with her work. That did not know it, then, if it is allowed to clarify, I congratulate to both: owlice and bystander. Oh, I did only a few; bystander's definitely doing the heavy lifting here! !